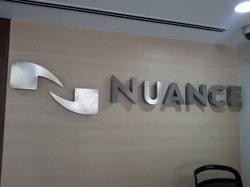 We are leading manufacturer and supplier of Letter Signage. Our offered products are Corporate Signboard, Advertising Signs and Outdoor Signs. Owing to our fair business practices & large shipping base, we are considered amongst the foremost provider of ACP LED Letter Signage. In adherence with industrial standards, this ACP signage is designed by our experts employing modern techniques. Obtainable in different sizes & designs, this ACP signage is widely used in promotional and advertisements purposes. Our quality controllers duly check ACP signage on certain quality norms before supplying to clients. With an aim to lead in allied market, our firm is successful engaged in offering ACP Acrylic Signage. Manufactured and designed with the use of premium quality raw materials and cutting-edge methods, the offered ACP signage is also checked on certain aspects before its delivery at clients' premises. This ACP signage is used by various business organizations for displaying information and certain notification for advertisement purpose. We are a trusted company, engaged in providing superlative array of ACP Acrylic Letters Signage made of finest grade material. The offered ACP signage is designed for installation at a number of places such as showrooms, shops, public places, airports & shopping malls. We develop various types of signage as per the requirements of our customers. Our experts use the best grade raw material in the preparation of ACP Signage for ensuring durability, reliability, and application suitability. We are devotedly engaged in providing our clients an exclusive range of ACP Titanium Letters Signage that come in a plethora of colors, sizes and designs. This ACP signage is manufactured using premium grade raw materials inculcating the newest techniques and advanced machines. The offered ACP signage is designed and printed by our ingenious professionals in adherence with the set quality standards. 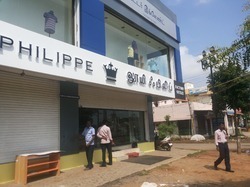 Apart from this, this cost-effective ACP Signage is useful in indicating the names of brand and advertisement. 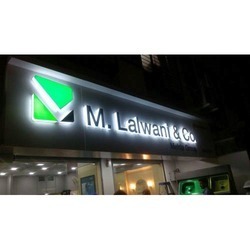 We are a coveted firm, involved in offering premium quality Acrylic LED Letters Signage. Our range of acrylic led letters perfectly matches with the set industrial standards in terms of quality, durability and performance. 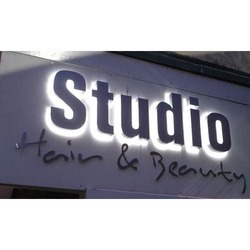 Manufactured as per the specifications mentioned by the patrons, these acrylic led letters are very easily installed on the walls and enhance the overall appeal with their excellent glitter. We have marked a distinct position in the market by providing a superior range of SS Letter Signage that has a minimum time quality, much like that of aluminium, brass and bronze. These offered letters are well designed from high grade stainless steel and advanced tools in accordance with the defined industry norms. Widely used in many promotional activities, apart from its wide applications our letters are also used in different types of advertisements. Backed by skilled workers, we are providing a vast range of Backlit LED Letter Signage to the customers. These are highly applauded by our clients due to its high quality, less maintenance, easy to install, user friendliness and effective performance. Known for its trendy look, these products are generally used in streets, roads, and highways. Apart from this, we provide customized facility to alter our range as per the necessities and desires of our customers. Looking for Letter Signage ?